Explain the relationship between the energy of a photon in joules or electron volts and its wavelength or frequency. Calculate the number of photons per second emitted by a monochromatic source of specific wavelength and power. These will make many calculations a little easier. All EM radiation is composed of photons. Figure 1 shows various divisions of the EM spectrum plotted against wavelength, frequency, and photon energy. Previously in this book, photon characteristics were alluded to in the discussion of some of the characteristics of UV, x rays, and rays, the first of which start with frequencies just above violet in the visible spectrum. It was noted that these types of EM radiation have characteristics much different than visible light. We can now see that such properties arise because photon energy is larger at high frequencies. Figure 1. The EM spectrum, showing major categories as a function of photon energy in eV, as well as wavelength and frequency. Certain characteristics of EM radiation are directly attributable to photon energy alone. Photons act as individual quanta and interact with individual electrons, atoms, molecules, and so on. The energy a photon carries is, thus, crucial to the effects it has. Table 1 lists representative submicroscopic energies in eV. When we compare photon energies from the EM spectrum in Figure 1 with energies in the table, we can see how effects vary with the type of EM radiation. Gamma rays, a form of nuclear and cosmic EM radiation, can have the highest frequencies and, hence, the highest photon energies in the EM spectrum. For example, a -ray photon with has an energy . This is sufficient energy to ionize thousands of atoms and molecules, since only 10 to 1000 eV are needed per ionization. In fact, rays are one type of ionizing radiation, as are x rays and UV, because they produce ionization in materials that absorb them. Because so much ionization can be produced, a single -ray photon can cause significant damage to biological tissue, killing cells or damaging their ability to properly reproduce. When cell reproduction is disrupted, the result can be cancer, one of the known effects of exposure to ionizing radiation. Since cancer cells are rapidly reproducing, they are exceptionally sensitive to the disruption produced by ionizing radiation. This means that ionizing radiation has positive uses in cancer treatment as well as risks in producing cancer. High photon energy also enables rays to penetrate materials, since a collision with a single atom or molecule is unlikely to absorb all the ray’s energy. This can make rays useful as a probe, and they are sometimes used in medical imaging. x rays, as you can see in Figure 1, overlap with the low-frequency end of the ray range. Since x rays have energies of keV and up, individual x-ray photons also can produce large amounts of ionization. At lower photon energies, x rays are not as penetrating as rays and are slightly less hazardous. X rays are ideal for medical imaging, their most common use, and a fact that was recognized immediately upon their discovery in 1895 by the German physicist W. C. Roentgen (1845–1923). (See Figure 2.) 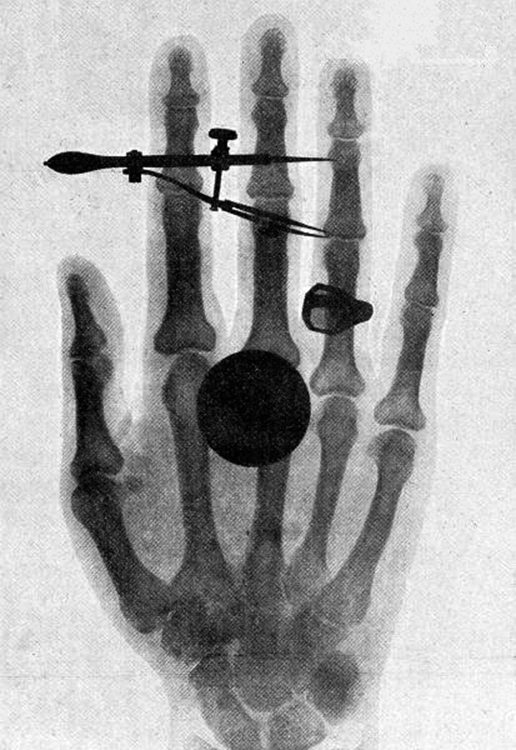 Within one year of their discovery, x rays (for a time called Roentgen rays) were used for medical diagnostics. Roentgen received the 1901 Nobel Prize for the discovery of x rays. Once again, we find that conservation of energy allows us to consider the initial and final forms that energy takes, without having to make detailed calculations of the intermediate steps. Example 1 is solved by considering only the initial and final forms of energy. Figure 3. X rays are produced when energetic electrons strike the copper anode of this cathode ray tube (CRT). Electrons (shown here as separate particles) interact individually with the material they strike, sometimes producing photons of EM radiation. While rays originate in nuclear decay, x rays are produced by the process shown in Figure 3. 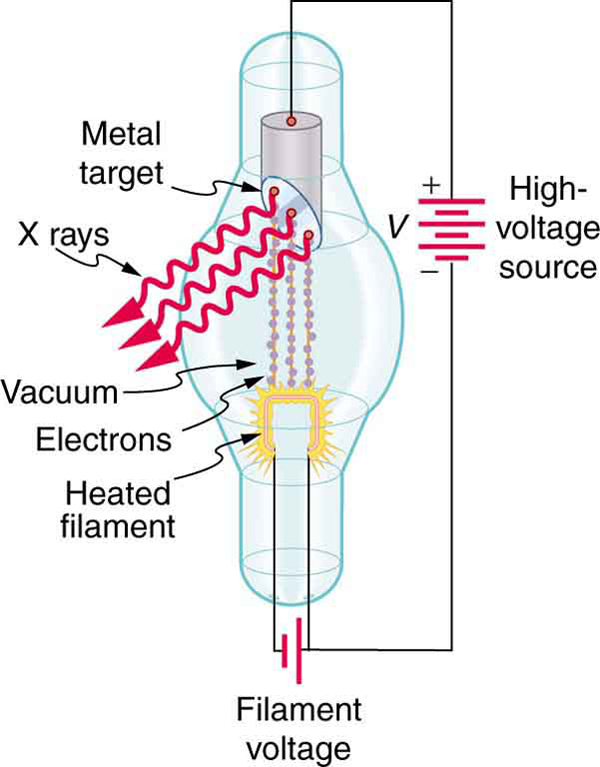 Electrons ejected by thermal agitation from a hot filament in a vacuum tube are accelerated through a high voltage, gaining kinetic energy from the electrical potential energy. When they strike the anode, the electrons convert their kinetic energy to a variety of forms, including thermal energy. But since an accelerated charge radiates EM waves, and since the electrons act individually, photons are also produced. Some of these x-ray photons obtain the kinetic energy of the electron. The accelerated electrons originate at the cathode, so such a tube is called a cathode ray tube (CRT), and various versions of them are found in older TV and computer screens as well as in x-ray machines. 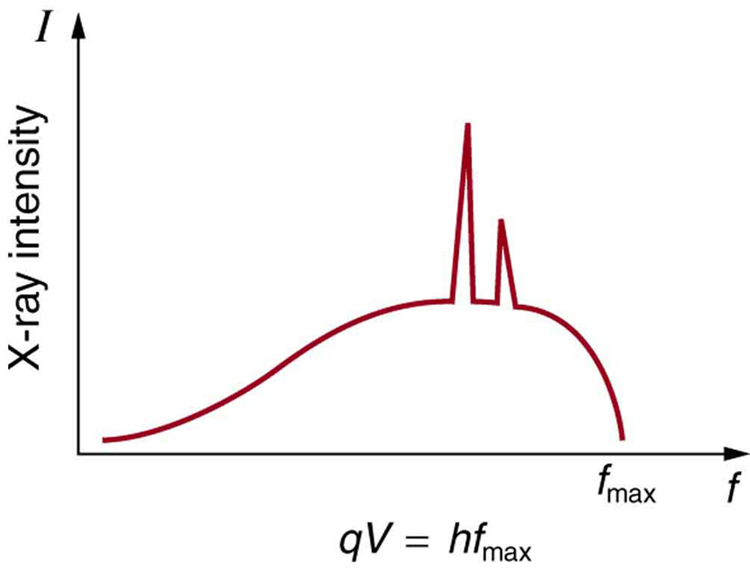 Find the maximum energy in eV of an x-ray photon produced by electrons accelerated through a potential difference of 50.0 kV in a CRT like the one in Figure 3. This example produces a result that can be applied to many similar situations. If you accelerate a single elementary charge, like that of an electron, through a potential given in volts, then its energy in eV has the same numerical value. 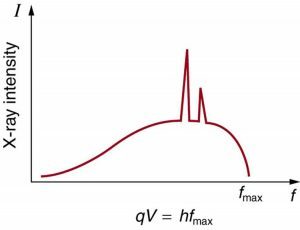 Thus a 50.0-kV potential generates 50.0 keV electrons, which in turn can produce photons with a maximum energy of 50 keV. Similarly, a 100-kV potential in an x-ray tube can generate up to 100-keV x-ray photons. Many x-ray tubes have adjustable voltages so that various energy x rays with differing energies, and therefore differing abilities to penetrate, can be generated. Figure 4. X-ray spectrum obtained when energetic electrons strike a material. The smooth part of the spectrum is bremsstrahlung, while the peaks are characteristic of the anode material. Both are atomic processes that produce energetic photons known as x-ray photons. Figure 4 shows the spectrum of x rays obtained from an x-ray tube. There are two distinct features to the spectrum. First, the smooth distribution results from electrons being decelerated in the anode material. A curve like this is obtained by detecting many photons, and it is apparent that the maximum energy is unlikely. This decelerating process produces radiation that is called bremsstrahlung (German for braking radiation). The second feature is the existence of sharp peaks in the spectrum; these are called characteristic x rays, since they are characteristic of the anode material. Characteristic x rays come from atomic excitations unique to a given type of anode material. They are akin to lines in atomic spectra, implying the energy levels of atoms are quantized. Phenomena such as discrete atomic spectra and characteristic x rays are explored further in Chapter 30 Atomic Physics. Ultraviolet radiation (approximately 4 eV to 300 eV) overlaps with the low end of the energy range of x rays, but UV is typically lower in energy. UV comes from the de-excitation of atoms that may be part of a hot solid or gas. These atoms can be given energy that they later release as UV by numerous processes, including electric discharge, nuclear explosion, thermal agitation, and exposure to x rays. A UV photon has sufficient energy to ionize atoms and molecules, which makes its effects different from those of visible light. UV thus has some of the same biological effects as rays and x rays. For example, it can cause skin cancer and is used as a sterilizer. The major difference is that several UV photons are required to disrupt cell reproduction or kill a bacterium, whereas single -ray and X-ray photons can do the same damage. But since UV does have the energy to alter molecules, it can do what visible light cannot. One of the beneficial aspects of UV is that it triggers the production of vitamin D in the skin, whereas visible light has insufficient energy per photon to alter the molecules that trigger this production. Infantile jaundice is treated by exposing the baby to UV (with eye protection), called phototherapy, the beneficial effects of which are thought to be related to its ability to help prevent the buildup of potentially toxic bilirubin in the blood. Short-wavelength UV is sometimes called vacuum UV, because it is strongly absorbed by air and must be studied in a vacuum. Calculate the photon energy in eV for 100-nm vacuum UV, and estimate the number of molecules it could ionize or break apart. Using the equation and appropriate constants, we can find the photon energy and compare it with energy information in Table 1. According to Table 1, this photon energy might be able to ionize an atom or molecule, and it is about what is needed to break up a tightly bound molecule, since they are bound by approximately 10 eV. This photon energy could destroy about a dozen weakly bound molecules. Because of its high photon energy, UV disrupts atoms and molecules it interacts with. One good consequence is that all but the longest-wavelength UV is strongly absorbed and is easily blocked by sunglasses. In fact, most of the Sun’s UV is absorbed by a thin layer of ozone in the upper atmosphere, protecting sensitive organisms on Earth. Damage to our ozone layer by the addition of such chemicals as CFC’s has reduced this protection for us. The range of photon energies for visible light from red to violet is 1.63 to 3.26 eV, respectively (left for this chapter’s Problems and Exercises to verify). These energies are on the order of those between outer electron shells in atoms and molecules. This means that these photons can be absorbed by atoms and molecules. A single photon can actually stimulate the retina, for example, by altering a receptor molecule that then triggers a nerve impulse. Photons can be absorbed or emitted only by atoms and molecules that have precisely the correct quantized energy step to do so. For example, if a red photon of frequency encounters a molecule that has an energy step, , equal to , then the photon can be absorbed. Violet flowers absorb red and reflect violet; this implies there is no energy step between levels in the receptor molecule equal to the violet photon’s energy, but there is an energy step for the red. There are some noticeable differences in the characteristics of light between the two ends of the visible spectrum that are due to photon energies. Red light has insufficient photon energy to expose most black-and-white film, and it is thus used to illuminate darkrooms where such film is developed. Since violet light has a higher photon energy, dyes that absorb violet tend to fade more quickly than those that do not. (See Figure 5.) 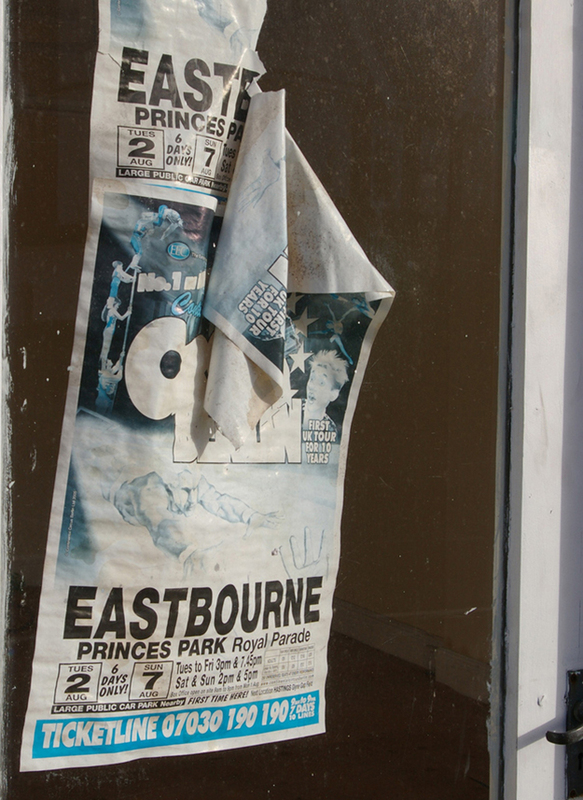 Take a look at some faded color posters in a storefront some time, and you will notice that the blues and violets are the last to fade. This is because other dyes, such as red and green dyes, absorb blue and violet photons, the higher energies of which break up their weakly bound molecules. (Complex molecules such as those in dyes and DNA tend to be weakly bound.) Blue and violet dyes reflect those colors and, therefore, do not absorb these more energetic photons, thus suffering less molecular damage. Transparent materials, such as some glasses, do not absorb any visible light, because there is no energy step in the atoms or molecules that could absorb the light. Since individual photons interact with individual atoms, it is nearly impossible to have two photons absorbed simultaneously to reach a large energy step. Because of its lower photon energy, visible light can sometimes pass through many kilometers of a substance, while higher frequencies like UV, x ray, and rays are absorbed, because they have sufficient photon energy to ionize the material. Example 3: How Many Photons per Second Does a Typical Light Bulb Produce? Assuming that 10.0% of a 100-W light bulb’s energy output is in the visible range (typical for incandescent bulbs) with an average wavelength of 580 nm, calculate the number of visible photons emitted per second. Power is energy per unit time, and so if we can find the energy per photon, we can determine the number of photons per second. This will best be done in joules, since power is given in watts, which are joules per second. This incredible number of photons per second is verification that individual photons are insignificant in ordinary human experience. It is also a verification of the correspondence principle—on the macroscopic scale, quantization becomes essentially continuous or classical. Finally, there are so many photons emitted by a 100-W lightbulb that it can be seen by the unaided eye many kilometers away. Infrared radiation (IR) has even lower photon energies than visible light and cannot significantly alter atoms and molecules. IR can be absorbed and emitted by atoms and molecules, particularly between closely spaced states. IR is extremely strongly absorbed by water, for example, because water molecules have many states separated by energies on the order of to , well within the IR and microwave energy ranges. This is why in the IR range, skin is almost jet black, with an emissivity near 1—there are many states in water molecules in the skin that can absorb a large range of IR photon energies. Not all molecules have this property. Air, for example, is nearly transparent to many IR frequencies. Microwaves are the highest frequencies that can be produced by electronic circuits, although they are also produced naturally. Thus microwaves are similar to IR but do not extend to as high frequencies. There are states in water and other molecules that have the same frequency and energy as microwaves, typically about . This is one reason why food absorbs microwaves more strongly than many other materials, making microwave ovens an efficient way of putting energy directly into food. Photon energies for both IR and microwaves are so low that huge numbers of photons are involved in any significant energy transfer by IR or microwaves (such as warming yourself with a heat lamp or cooking pizza in the microwave). Visible light, IR, microwaves, and all lower frequencies cannot produce ionization with single photons and do not ordinarily have the hazards of higher frequencies. When visible, IR, or microwave radiation is hazardous, such as the inducement of cataracts by microwaves, the hazard is due to huge numbers of photons acting together (not to an accumulation of photons, such as sterilization by weak UV). The negative effects of visible, IR, or microwave radiation can be thermal effects, which could be produced by any heat source. But one difference is that at very high intensity, strong electric and magnetic fields can be produced by photons acting together. Such electromagnetic fields (EMF) can actually ionize materials. It is virtually impossible to detect individual photons having frequencies below microwave frequencies, because of their low photon energy. But the photons are there. A continuous EM wave can be modeled as photons. At low frequencies, EM waves are generally treated as time- and position-varying electric and magnetic fields with no discernible quantization. This is another example of the correspondence principle in situations involving huge numbers of photons. Photon energy is responsible for many characteristics of EM radiation, being particularly noticeable at high frequencies. Photons have both wave and particle characteristics. 1: Why are UV, x rays, and rays called ionizing radiation? 2: How can treating food with ionizing radiation help keep it from spoiling? UV is not very penetrating. What else could be used? 3: Some television tubes are CRTs. They use an approximately 30-kV accelerating potential to send electrons to the screen, where the electrons stimulate phosphors to emit the light that forms the pictures we watch. Would you expect x rays also to be created? 4: Tanning salons use “safe” UV with a longer wavelength than some of the UV in sunlight. This “safe” UV has enough photon energy to trigger the tanning mechanism. Is it likely to be able to cause cell damage and induce cancer with prolonged exposure? 5: Your pupils dilate when visible light intensity is reduced. Does wearing sunglasses that lack UV blockers increase or decrease the UV hazard to your eyes? Explain. 6: One could feel heat transfer in the form of infrared radiation from a large nuclear bomb detonated in the atmosphere 75 km from you. However, none of the profusely emitted x rays or rays reaches you. Explain. 7: Can a single microwave photon cause cell damage? Explain. 8: In an x-ray tube, the maximum photon energy is given by . Would it be technically more correct to say , where BE is the binding energy of electrons in the target anode? Why isn’t the energy stated the latter way? 1: What is the energy in joules and eV of a photon in a radio wave from an AM station that has a 1530-kHz broadcast frequency? 2: (a) Find the energy in joules and eV of photons in radio waves from an FM station that has a 90.0-MHz broadcast frequency. (b) What does this imply about the number of photons per second that the radio station must broadcast? 3: Calculate the frequency in hertz of a 1.00-MeV -ray photon. 4: (a) What is the wavelength of a 1.00-eV photon? (b) Find its frequency in hertz. (c) Identify the type of EM radiation. 5: Do the unit conversions necessary to show that , as stated in the text. 6: Confirm the statement in the text that the range of photon energies for visible light is 1.63 to 3.26 eV, given that the range of visible wavelengths is 380 to 760 nm. 7: (a) Calculate the energy in eV of an IR photon of frequency . (b) How many of these photons would need to be absorbed simultaneously by a tightly bound molecule to break it apart? (c) What is the energy in eV of a ray of frequency ? (d) How many tightly bound molecules could a single such ray break apart? 8: Prove that, to three-digit accuracy, , as stated in the text. 9: (a) What is the maximum energy in eV of photons produced in a CRT using a 25.0-kV accelerating potential, such as a color TV? (b) What is their frequency? 10: What is the accelerating voltage of an x-ray tube that produces x rays with a shortest wavelength of 0.0103 nm? 11: (a) What is the ratio of power outputs by two microwave ovens having frequencies of 950 and 2560 MHz, if they emit the same number of photons per second? (b) What is the ratio of photons per second if they have the same power output? 12: How many photons per second are emitted by the antenna of a microwave oven, if its power output is 1.00 kW at a frequency of 2560 MHz? 13: Some satellites use nuclear power. (a) If such a satellite emits a 1.00-W flux of rays having an average energy of 0.500 MeV, how many are emitted per second? (b) These rays affect other satellites. How far away must another satellite be to only receive one ray per second per square meter? 14: (a) If the power output of a 650-kHz radio station is 50.0 kW, how many photons per second are produced? (b) If the radio waves are broadcast uniformly in all directions, find the number of photons per second per square meter at a distance of 100 km. Assume no reflection from the ground or absorption by the air. 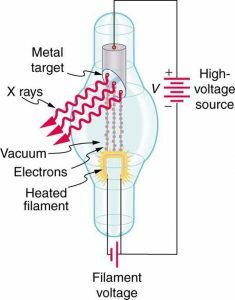 15: How many x-ray photons per second are created by an x-ray tube that produces a flux of x rays having a power of 1.00 W? Assume the average energy per photon is 75.0 keV. 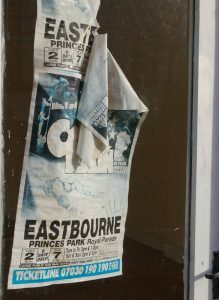 16: (a) How far away must you be from a 650-kHz radio station with power 50.0 kW for there to be only one photon per second per square meter? Assume no reflections or absorption, as if you were in deep outer space. (b) Discuss the implications for detecting intelligent life in other solar systems by detecting their radio broadcasts. Consider a laser pen. Construct a problem in which you calculate the number of photons per second emitted by the pen. Among the things to be considered are the laser pen’s wavelength and power output. Your instructor may also wish for you to determine the minimum diffraction spreading in the beam and the number of photons per square centimeter the pen can project at some large distance. In this latter case, you will also need to consider the output size of the laser beam, the distance to the object being illuminated, and any absorption or scattering along the way. 29.3 Photon Energies and the Electromagnetic Spectrum by OpenStax is licensed under a Creative Commons Attribution 4.0 International License, except where otherwise noted.